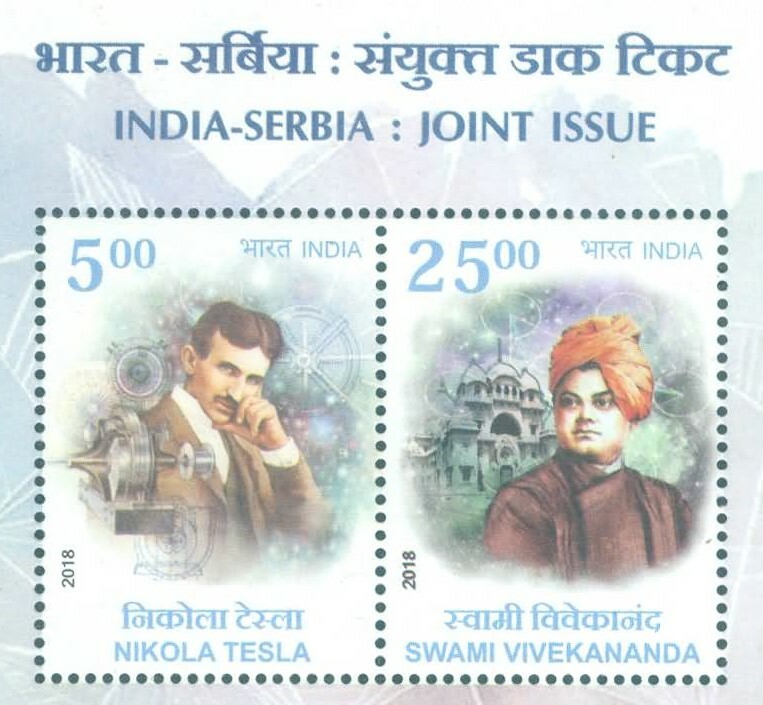 Updated on 22 Sep 2018: A joint stamp issue between India and Serbia was announced by Serbia Post Office as early as January this year, but India Post officials did not confirm the existence of this stamp set, despite repeated requests, until it's very issuance on 15th September. The stamp were originally planned for release on 9th October, but were later scheduled for release on 3rd September during an official trip of the Vice President of India to Serbia. Due to the national mourning period in late-August for the former Prime Minister of India Vajpayee, the dates of this trip were adjusted and changed to 15th September. So, even though these were issued a few weeks earlier than originally known, there was a minor last minute delay. The stamp subject for the joint stamp issue is quite interesting. The Serbian side chose well known inventor and engineer Nikola Tesla and the Indian government chose the well known philosopher and spiritual leader Swami Vivekananda. On the surface this appears to be a complete mismatch; with a scientist and a religious philosopher, but Tesla and Vivekananda have something in common and shared a friendship. Serbia and India are celebrating 70 years of their diplomatic relations and 2018 is also 125th year of Swami Vivekananda's landmark speech on Hinduism during the World Religion Parliament in Chicago (1893). So, kudos to the postal administrations for this well thought commemoration. 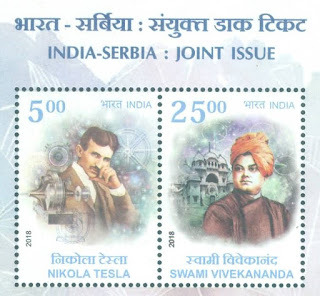 The stamp on Tesla was designed by Boban Savic 'Geto' of Serbia and the one on Vivekananda was done by Gulistaan, an artist working with the Indian Post Office. Stamps from the Serbia Post Office were printed in sheetlets of 4 se-tenant pairs (65,000 stamps each). 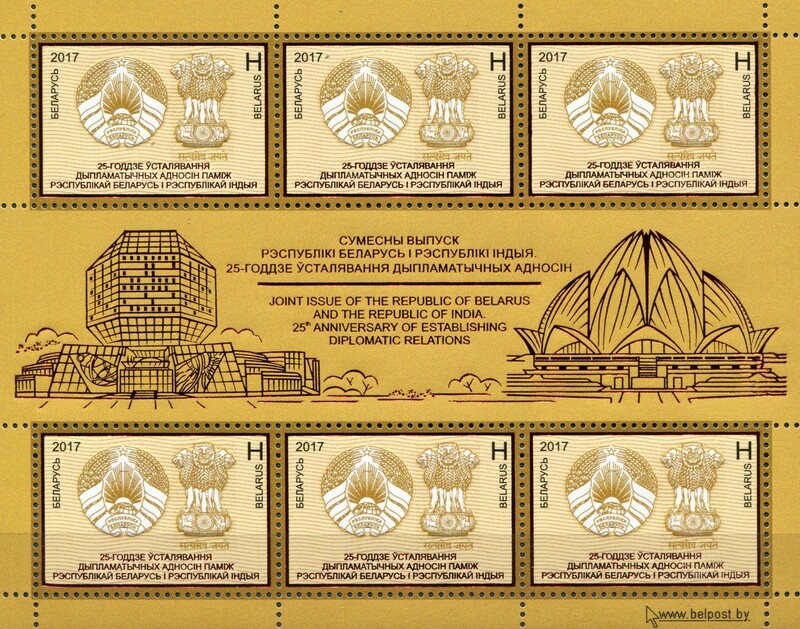 In addition to the two individual stamp sheets (45 stamps each), India Post also issued a souvenir sheet comprised of the two stamps. I'm still awaiting details on the print quantity for the Indian stamps, but will add it here once available. I've noticed several collectors wonder about the links between Tesla and Vivekananda, so it was worth looking for some information about their connection and friendship. Apparently it all began in February 1896 in New York City, when Tesla and Vivekananda met after a play by actress Sarah Bernhardt. After discussions and exchanges about Akasha, Prana and Kalpa, Swami ji and Tesla's friendship seems to have begun. Vivekananda believed that if Tesla can prove matter can be reduced to energy, the concept of Vedanta would be backed by Western science as well. Tesla continued his research to prove this, and was influenced by Vivekananda in later years, even using Sanskrit words Akasha and Prana for matter and energy, respectively. Neither Tesla was fully successful in proving this theory, nor Vivekananda was alive much longer to observe this. But, there was clear connect between the East and West and is nicely represented in these stamps. 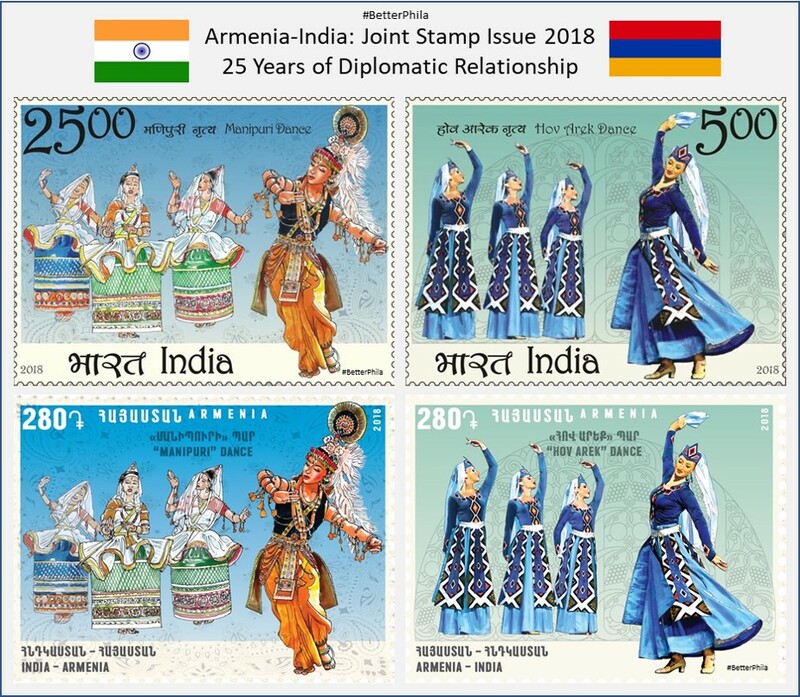 Update (14 Sep 2018): After so many delays and rescheduled dates, the joint stamps between Armenia and India were dedicated at a ceremony in Yerevan, Armenia on 29th August 2018. Thanks to HayPost officials, the late-August date timing that I'd shared here and on Twitter was accurate. Even though the stamp subject of dances remained, Armenia appears to have changed their dance form at the last minute. India Post first day covers that were initially printed showed Berd dance, but the final stamps show Hov Arek dance form, so the FDCs were likely reprinted. 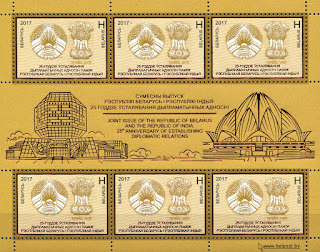 The new envelopes from India Post show some architectural elements from unknown monuments. Armenia Post issued the stamps in a sheetlet of 5 se-tenant pairs. HayPost's website stamps.am is selling singles and sheetlets, albeit higher than face value price, which is quite surprising. FDCs have been printed, in an unknown quantity and are not available on their website. Armenian FDCs show Etchmiadzin Cathedral and Taj Mahal. India Post on the other hand printed both the stamps in individual sheets of 45 stamps each, along with a miniature sheet with both the stamps. Suresh Kumar Achari and Vahagn Mkrtchyan designed the stamps for their respective postal administrations. The joint stamp show Manipuri dance from India and Hov Arek dance from Armenia. India Post had issued a stamp on Manipuri dance previously in 1975 as well. I don't like the font used on the Indian stamps and it'd not even mentioned about Hov Arek being an Armenian dance. 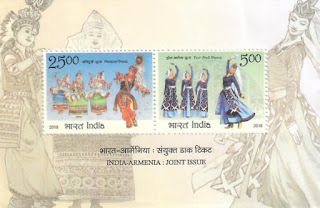 Armenian stamps have better overall design, but they messed up the Indian Manipuri dance stamp by adding the background details even on the white portion of the stamp. 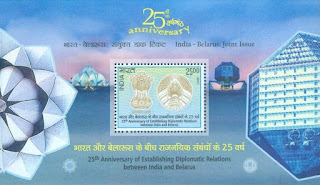 Anyways, I truly hope no more dances are used for Indian joint stamps; this was the fifth one since 2006. Hay Post issued 40,000 stamps of each design (280 Armenian Dram each), printed at Cartor Security Printing in France. Indian stamps were printed in SPP, Hyderabad (5 Rupees and 25 Rupees denomination), but print quantity details are still awaited - I will add it here once I get my hands on a brochure. Manipuri dance: This classical Indian group dance, also known as Jagoi originated in the North-Eastern state of Manipur and is based on Vaishnavism, Shaivism, Shaktism themes of Hindu religion. This traditional dance includes slow, lyrical and graceful movements to the tune of Pung (drum), kartal, harmonium, sembong, pena and flute. Lyrics are typically devotional songs using Jayadeva's, Vidyapati's or other medieval poets writings in Sanskrit, Braj or Maithili languages. The dance is also inspired heavily by Radha-Krishna Raas. Female dances dress like brides in Poltoi and Kumil, which is a barrel-like skirt whereas male dancers wear dhotis. Hov Arek dance: Armenia's Hov Arek or Areq is performed using a lyrical folk song by the same name written by composer and priest Komitas. It is considered among the 100 most important songs in Armenian cultural heritage. I'm surprised at the choice of this dance, because it appears to be more of a song than a well known dance itself. In my opinion, Berd would have been a clear pick from the national dances of Armenia. Use the links below if you want to look at a couple of videos showing these dances. 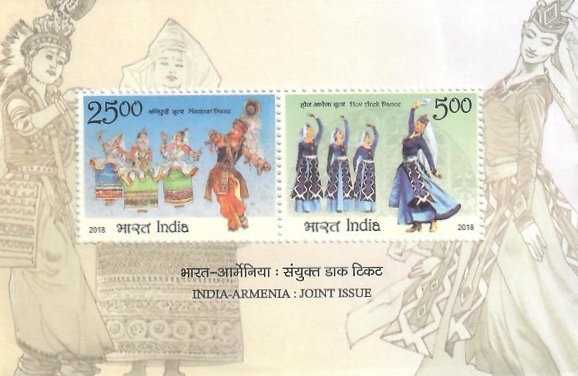 Update (07 Jul 2018): First day covers for the Indian version of this stamp have been printed and appear to depict Jagoi Manipuri dance from India and Berd from Armenia (like I had predicted in January this year). This issue has been delayed several times and the from the last update, HayPost Armenia indicated they are trying to get it done in August 2018. Let's see where this ends up. Looking forward to a good stamp design. Update (21 Jan 2018): Just to be clear, the currently proposed date for issuance is 21st March 2018. 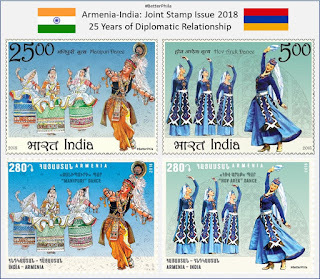 Original Post (17 Jan 2018): I've been trying to get details for the joint stamp issue between India and Armenia over the last year and a half. This stamp issue was discussed in bilateral meetings since 2016 and will likely materialize this year. I've been able to confirm from Haypost and India Post that the theme for this joint issue will be Dances. In the recent past, India has used dance as a subject for joint issues with Cyprus (2006), Mexico (2010), Portugal (2017) and Russia (2017). It would have been nice to see some more creativity from the India Post officials to find similarities between the two cultures and then select a subject. All these Indian dance forms can easily be commemorated on a separate set of stamps dedicated to Dances of India. 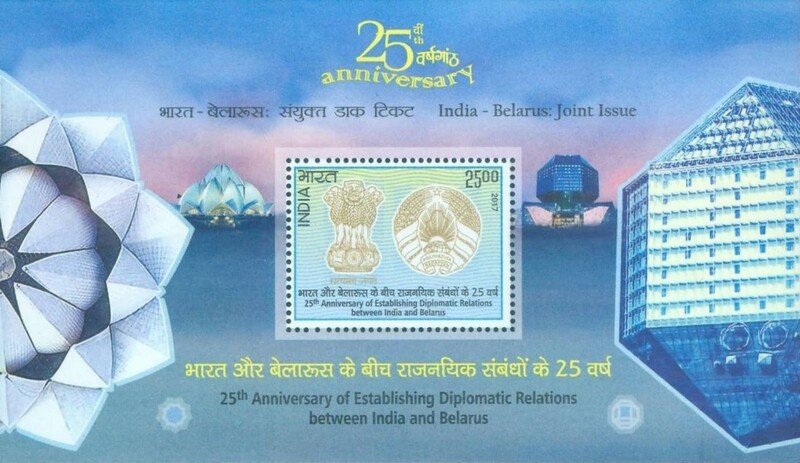 Diplomatic contact between Armenia and India were established in 1992 and the stamp issue will likely celebrate 25 years of this relationship. The joint stamp is currently scheduled for issuance in third week of March 2018, but I will confirm this as soon as additional information is available. Any guesses for Indian Dance forms?